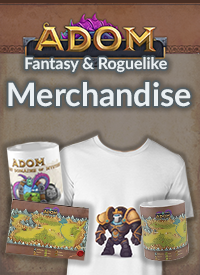 Change is in the air, my dear friends... a new year is looming ahead of us and it is probably going to be the most exciting year ever for Team ADOM (although the crowdfunding and stuff have been extremely exciting). Now that we are basically done with all the crowdfunding stuff we are going to look into the future to see what it holds. And our main focus now will be getting Ultimate ADOM on the road. The past few months have been filled with experiments, design work and more (and there are more such months ahead of us... especially in the graphical and coding department) but now we are going to focus 80+% of our full-time ADOM development jobs on trying to create the ultimate roguelike fantasy gaming experience. While we are working on the engine in the background I will start a series of blog posts in order to discuss basic assumptions of the next generation ADOM experience (read: sacred cows... how many are we going to slaughter in order to create something better?). Ultimate ADOM Product Line: "One game to rule them all" versus "As many variants as are needed to tell all interesting stories". Difficulty/Setting dials: Configuring ADOM explicitly (for your personal perfect enjoyment) and implicitly (to create platform-specific game variants). Senses in roguelike games: blindness, deafness, muting, being invisible - the pros and cons of these details. Item status: cursed/uncursed/blessed versus a much more advanced system. Item management: weight versus slots versus nothing at all? Hunger: should we feel it? Movement: diagonal movement versus straight movement. Internationalization: translating Ultimate ADOM into other languages. Item statistics: how many and which do we need when? Long actions: how important are actions that cause more than one turn to pass? Size: of items and monsters: do we care? And how much? Permanent rewards: how should permanent modifications be handled in the future in order to reduce the urge of grinding? Picking up and dropping items: Manually, automatically or a mix of it? Graphics: 2D versus 3D (and what's with ASCII)? Crafting: how would a smart and fun crafting system look like? Salvaging: what else can you do with items besides dropping, destroying, carrying or using them? Alchemy: Beyond potion recipes. How about salvaging items for their elemental energies and using those to buff spells, talents and other items? Modding: What's a good modding approach and how much do you want? Maps: Level sizes. How large is large enough? These topics will not be covered in any particular order but rather as mood and need demand. I intend to discuss these points here on the blog, on Facebook, on Twitter, on Reddit, on Steam and in our beloved forums (so: where ever you feel most comfortable). As soon as I start posting on the series I am looking forward to your opinions, ideas and feedback. The goal will be to question many of the core systems, subsystems and rules in ADOM in order to see if and how it could be improved in the future. 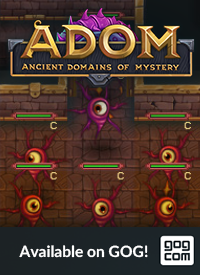 All this while trying to keep the spirit of ADOM - we do not want to invent a completely new game that only carries the ADOM label with it. 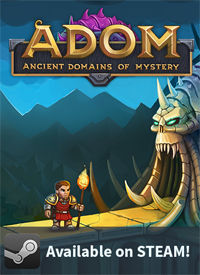 It should be recognizable and keep the beloved features that made ADOM what it is. So stay tuned for more posts in the near future discussing actual content! Dungeon level sizes might be an interesting topic. Presumably it will be possible for them to be bigger than a single ASCII screen, but this is an area where ADOM II went a bit overboard. I **haaaated** the dungeon sizes in ADOM II. I really don't want an epic sprawl every single floor. Part of ADOM's appeal for me is the "bite size" levels. I'd love to see customized level size. Playing ADOM since 1998. I remember that ADOM had this unofficial feature to generate big levels if screen size on windows was bigger than standart 80x25 - that was just awesome, great new experience. For those who hate large levels - they can just NOT increase the size in their configuration XD. Also: Grinding sacrifices/offerings to get an early game artifact to raise your power level significantly. Does it add to the game play? Is it fun? You wrote: "Permanent rewards: how should permanent modifications be handled in the future in order to reduce the urge of grinding?" Early parts of ADOM are most frustrating and tiresome. If you are not an expert player it will takes dozens of tries to get to interesting parts. So small permanent rewards would be great. For example: more food, poison resistance intrinsic, small boost to initial piety, scroll of light, "extra life" on level 1-5. Yes, 2D graphics is way better detailed and requires minimum resources, compared to very easy to fark-up 3D graphics with usually Junk animation that we have seen thousands of times. I found the way 3d works in Dwarf Fortress quite good for roguelike. Although I played in ASCII only. Even if there is a decision to go with 2d there could be at least some interactions related to height. For example falling into chasm on level could render you crippled several dungeon levels below. 2d in current style works great. I like "Arcanum" crafting - you need recipe and components. Senses, item status and hunger need to stay - i like finding ways managing them. Whatever you do, please keep a "classic" mode always an option.